Jim has been dedicated to providing the best possible treatments and outcomes in Spokane for the past 18 years and, as co-owner of Thompsons, it is also his responsibility to help lead this talented group of practitioners and technicians as one of the largest providers in the Northwest. In 1985, Jim lost his right foot below the knee in an unfortunate accident aboard Coast Guard Cutter out of Los Angeles. With the support of his family and his dear wife Stacey, he pursued a career in Prosthetics and Orthotics. After graduating from the University of Washington in 1994, Jim and Stacey moved to Spokane to start their family. Jim’s philosophy is simple: being an amputee himself, the patient comes first. He believes in the team approach to rehabilitative health care. By listening to each patient’s thoughts, concerns and personal goals, this allows him to appreciate their unique situations and develop the most effective prosthetic and orthotics solutions. Henry is a licensed and certified Prosthetist and Orthotist. He has been working in the profession of Orthotics and Prosthetics since 1988. Henry became interested in the field of prosthetics, learned about a course of study, completed the program and received his certificate in Prosthetic Technology from Spokane Falls Community College. Upon graduation, he moved to Seattle, worked in the field as a technician and decided to pursue the field and his education further. He graduated from Western Washington University with a Bachelors of Arts degree, and obtained his certificate in Prosthetics from Shelby State College located in Memphis, TN. 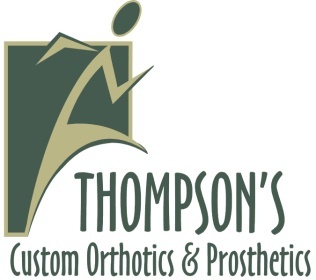 Henry Bennett and Jim Cahill have owned and operated Thompson’s Orthotics and Prosthetics, Inc. since 2000. Henry has served as the President of the Northwest Chapter of the American Academy of Orthotists & Prosthetists and as the President of the Washington Orthotic and Prosthetic Association. He is a current Fellow of the American Academy of Orthotists & Prosthetists (FAAOP). Henry served for seven years as a Sergeant in the Washington State Army National Guard specializing in the medical field as a paramedic. Henry has a true commitment and passion for the field of Orthotics and Prosthetics. He enjoys the challenges presented on a daily case-by-case basis, the adaptation of success to meet these challenges and the reward gained through helping others. Vince is the leader of our 5 person technical staff. His personality and sense of humor is the perfect combination needed to be liaison between Practitioners and technicians. Always staying positive seems to be one of many talents. Born is Northeast Missouri, Vince moved to Spokane in 1986 and graduated from West Valley High in 1987. He graduated from the Spokane Falls Orthotic and Prosthetic Technician program in 1992 and became a certified technician with the American Board of Orthotics and Prosthetics in 1995. Vince, his wife Tish and their two children love living in the great Northwest. Orthotics and Prosthetics have always been part of Vince’s life. His father, Mike Wilson grew up with polio and spent over 30 years as an orthotist recently retiring as a highly respected Orthotic instructor at Spokane Community College. Andrew’s unique life experience has guided him to a satisfying career in providing prosthetics and orthotics devices. After graduation from the University of Illinois, he moved to Seattle with his wife, Susan in 1992. In 2001, Andrew suffered a major traumatic tibia plateau fracture while snow skiing. He spent 69 days in the hospital and endured 18 surgeries. The end result was below knee amputation. Throughout his arduous recovery, he found inspiration from plethora prosthetic patients and decided to change careers. He graduated with a Prosthetic degree from California State University in 2005. Andrew learned empathy from his unique experience as a patient and clinician. He tremendously enjoys applying his skills, education and experience to provide a custom solution for his patients. He specializes in using the latest technology to provide successful solutions for his patient’s mobility deficiencies. Additionally, Andrew thrives on treating patients suffering from recent limb loss. He enjoys providing inspiration and motivation to his patients to accomplish their rehabilitation goals. He takes extra time to listen to his patients and provide solutions for their individual needs. Moreover, he embraces coordinated healthcare professional team approach for complete treating the patients. For example, communicating with Physical Therapist regarding the patient’s gait training progression with the device. When not treating patients, Andrew enjoys skiing, boating, wakeboarding, hiking, mountain biking, golfing and spending time with his wife and two young boys. Cameron graduated from Washington State University in 2009 with a bachelors degree in Kinesiology and a minor in Psychology. He got introduced to the field while working at Cascade DAFO in the manufacturing lab. After working there for 3 years Cameron wanted to have a stronger influence on patient care and decided to pursue the field further. He received his Post- Bachelorette Certification in Orthotics and Prosthetics from Northwestern University in 2013. Cameron moved to Spokane from Bellingham in January of 2014 to work at Thompson’s Custom Orthotics as a Resident Orthotist. Cameron is now a board certified Orthotist and completed his prosthetics residency. Cameron is looking forward to have a direct impact on patient care and improving people’s lives. Cameron enjoys spending time with his wife, Lauren and their 2 children, Camden and Addison. In his free time he likes to spend his time outdoors - camping, hunting and fishing.